It’s just about Labor Day weekend and today we have one cocktail that I’ve really labored over. In fact, if you’ve been paying very close attention, you’ve been following us through two different versions of an old and, I think, under-appreciated pre-prohibition era drink named after a social club of rich guys from Philadelphia with, I gather, pretty decent taste in beverages. In the way of nearly all trilogies, today’s drink brings us full circle. I started this series out by musing how a Gibson differed from a Martini only in terms of a garnish, switching out the usual lemon twist or olive in favor of a cocktail onion. The Clover Leaf differs from the Clover Club only in that it includes an actual leaf as a garnish, but not — and I’m sure this is for very good reason — an actual Clover Leaf. This recipe, however, does contain other alterations in the recipe from prior weeks, but I’ll explain about that on the flip side. Once again, combine all the ingredients in a cocktail shaker and “dry shake” the drink without adding any ice to emulsify the egg white good and proper. Then, add plenty of ice and shake very vigorously. Then, of course, you strain the resulting beverage into a chilled cocktail glass. Add the fresh mint sprig. I’ll let you come up with your own toast this time. You might recall from a couple of weeks back that I found Robert Hess’s recipe from The Essential Cocktail Guide a bit much for my tart-sensitive taste buds, even with all that wonderfully frothy egg white. This week, however, I noticed that some recipes I was seeing online called for a full two ounces of gin instead of the 1.5 ounces I’ve been calling for. As the Clover Club is a relatively mild drink, with just one type of booze included in an entirely reasonable amounts, and as I had finally finished my enormous bottle of 94 proof Beefeater Gin and had switched to merely 86 proof Bombay Dry, it seemed to make sense to try the Clover Leaf with a tiny bit more gin. What I found was that the slightly increased booze cut the tartness level just enough that using the full 3/4 ounce of lemon juice was now not only acceptable, but kind of delightful. 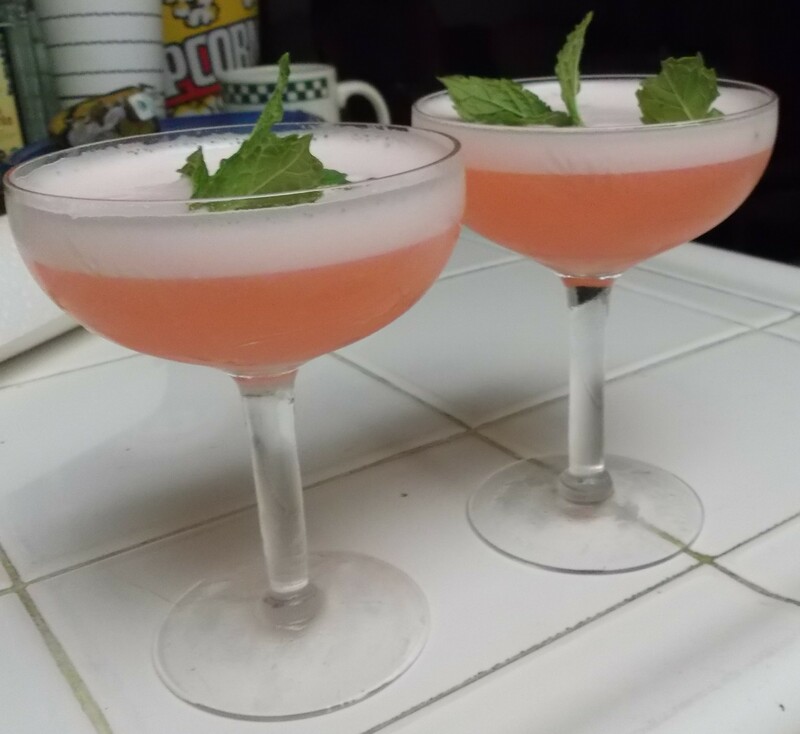 In fact, while the vast majority of the Clover Clubs and Clover Leafs I’ve made using both grenadine and Torani raspberry syrup have also been delightful, the last one I made, using 3/4 ounce lemon juice and raspberry syrup, might well have been the best of them all. A couple of additional notes on ingredients: I used Master of Mixes grenadine, which contains the oh-so-hated high fructose corn syrup but also has, we’re told, real cherry and (the key ingredient) pomegranate juice. I haven’t tried the other mass market brands like Rose’s, but I have a feeling that the more real pomegranate juice, the better and, as far as I can tell, they don’t have any actual juice at all. Feel free to spend a bit more on a more upscale grenadine or go crazy and make your own — it’s your delicious funeral. Also, a quick caveat emptor as I was just Googling around and found the Master of Mixes product for the criminally inflated price of $23.00 and above at some places online. I paid, I’m pretty sure, $3.99 or less or so at BevMo for mine. Finally, it occurs to me that I haven’t really discussed the effect of the name-changing garnish in the Clover Leaf, that sprig of mint. I have to say that, even though I was using literally the freshest possible mint — no thanks to me, there’s some growing in the backyard of the Drink of the Week ‘Plex — it really didn’t alter the flavor of the beverage very much, give or take some nice minty fragrance. On the other hand, it sure did make the drink look pretty.